According to Wikipedia, 16 Australians have been awarded a Nobel Prize since 1915, with the majority of these being in physiology or medicine. 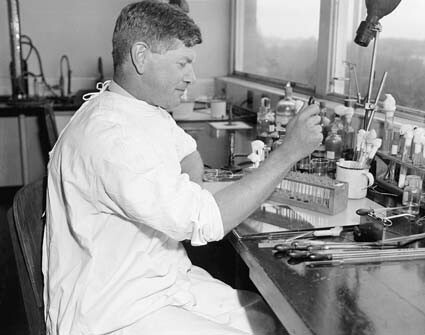 Some of the Australian Nobel laureates from these fields are not familiar names, but one medical scientist, Sir Frank Macfarlane Burnet (1899-1985), is widely regarded as the greatest scientist Australia has produced. Macfarlane Burnet was born in Traralgon, Victoria, and it is noteworthy that his 60 years of work were undertaken almost continuously in Australia. Early in his career he was appointed to the Melbourne-based Walter and Eliza Hall Institute of Research in Pathology and Medicine and, after research and postgraduate study in London, he returned to Melbourne in 1928 as the Institute’s assistant director. He was appointed director in March 1944 and at the same time was appointed professor of experimental medicine at the University of Melbourne. Our immune system protects us against attacks by microorganisms and rejects foreign tissue. Part of our immunity has a hereditary basis, but part of it is acquired and is not present in the fetus. 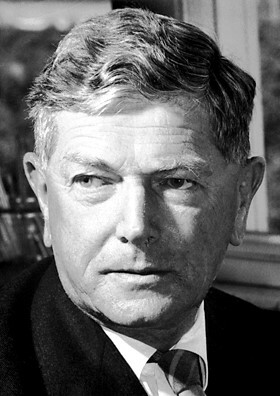 In 1949 Macfarlane Burnet theorized that the ability to distinguish between one’s own and foreign tissue is not hereditary but is acquired during the fetus stage. The theory was substantiated when Peter Medawar succeeded in performing transplants of tissue between different mouse fetuses. The results had significance for organ transplants. The shared prize was presented to Burnet and Medawar in Stockholm on 10 December 1960 and two days later Burnet presented his Nobel Lecture: ‘Immunological recognition of self’. Burnet had been knighted in 1951. (He later received a second knighthood under the Order of Australia and an Order of Merit from the Queen.) He retired at the age of 66 but continued his work at the University of Melbourne and was also a wide-ranging contributor to public life, including a term as President of the Australian Academy of Science. He was a prolific writer on many subjects. In addition to scientific works, his publications included an autobiography, Changing Patterns: An Atypical Autobiography (1968), a history, Walter and Eliza Hall Institute, 1915-1965 (1971), and Dominant Mammal: The Biology of Human Destiny (1970). The most significant general biography of Sir Macfarlane Burnet is Burnet: A Life, by Christopher Sexton, published in 1999 by Oxford University Press. An earlier edition was published in 1991 as The Seeds of Time. There is a Burnet Institute for Medical Research.